The La Comedia Dinner Theatre cast of “Almost Heaven: Songs of John Denver” perform a number at the theater in Springboro. They are, clockwise from top center, Chris Kramer, Christen Placa, Tonya Oslack, Christ Beiser, Digger Howard and Hannah Brown. 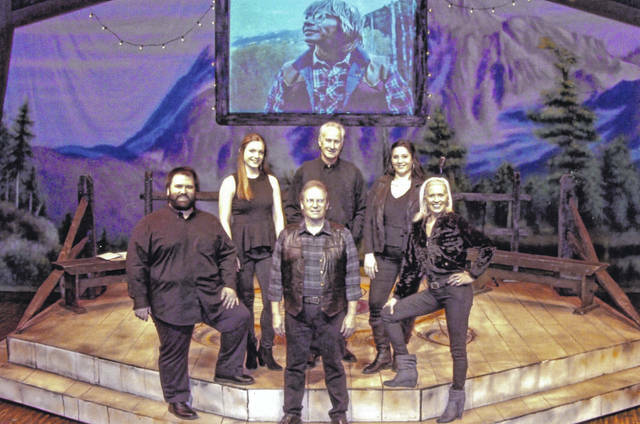 SPRINGBORO — La Comedia Dinner Theatre, 765 W. Central Ave., Springboro, is presenting “Almost Heaven: Songs of John Denver” through Feb. 17. It’s a production that will take the audience on a high-energy journey throught he life and times of one of the mos accoplished musicians and songwriters, whose career spanned some of the most challenging times in American history. Conceived by Harold Thau, written and adapted by Peter Glazer with original orchestrations and vocal arrangements by Jeff Waxman, the show features lighting design by Timothy A. Guth and scenic design by Ivory Mazur. Music director was Sue Combs. In the cast are Chris Beiser, Hannah Brown, Digger Howard, Chris Kramer, Tonya Oslack and Christen Placa. The dinner menu for this production includes six-herb turkey breast, roast pork and sauerkraut, southern fried chicken, beer-battered fried Norwegian cod, cornbead, white beans with peppers and onions, beef and noodles, garlic potatoes and onions, fried green tomatoes, sweet potato souffle and apple pie ala mode. Tickets cost $61 to $74 for adults, $30 for children 11 and under. They are available online at www.lacomedia.com and by phone at 800-677-9505.
https://www.sidneydailynews.com/wp-content/uploads/sites/47/2019/01/web1_Almost-heaven.jpgThe La Comedia Dinner Theatre cast of “Almost Heaven: Songs of John Denver” perform a number at the theater in Springboro. They are, clockwise from top center, Chris Kramer, Christen Placa, Tonya Oslack, Christ Beiser, Digger Howard and Hannah Brown.